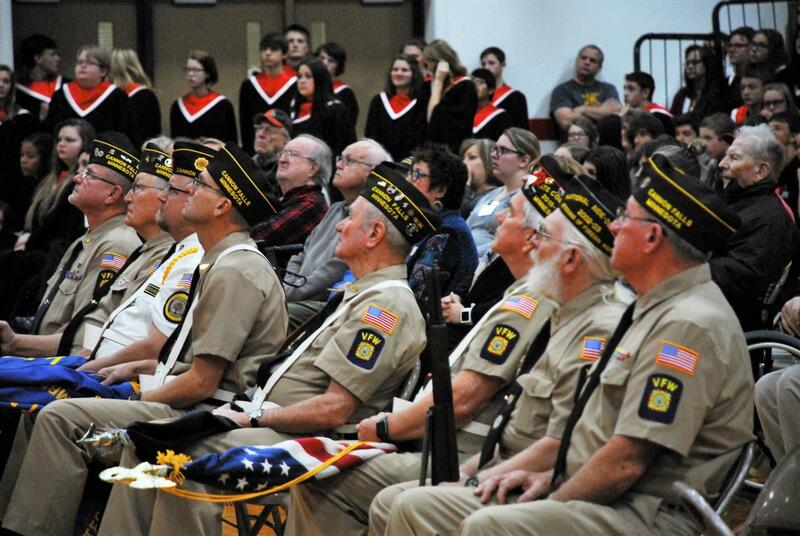 Marching into the gym with the procession of flags held high and proud were teacher Joel Rustad, former teacher John Hobert, and former student and special guest Jesse Johnson along with a host of local veterans. Each of these three performed a special function in this celebration of the 100th year anniversary of Veterans’ Day. Johnson, a lieutenant colonel in the army, made his way to the podium to give this years speech. Lieutenant Colonel Jesse Johnson was introduced as a Cannon Falls native, who has returned with his family after moving throughout the United States. He gave a memorable speech as he looked back on his years spent in the military. Before the colors were retired and the service ended, veteran John Hobert, a former CFHS agriculture teacher presented a slideshow. It was a collection of photography and profiles of the active and former military members from Cannon Falls as far back as WWI. Overall, this Veterans’ Day service was definitely a success as an honorable tribute to the courageous individuals of our community.